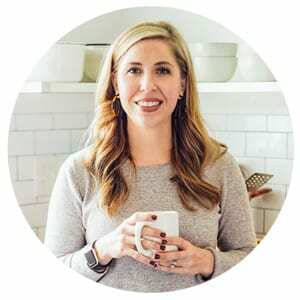 During the school year, I’m all about fast, simple, and nourishing breakfast options. I keep a set breakfast menu for the school year, and the menu doesn’t change much: oatmeal, smoothies, eggs (scrambled, hardboiled, cups, or “fried”), prepped baked goods (banana bread, muffins, toast, etc. 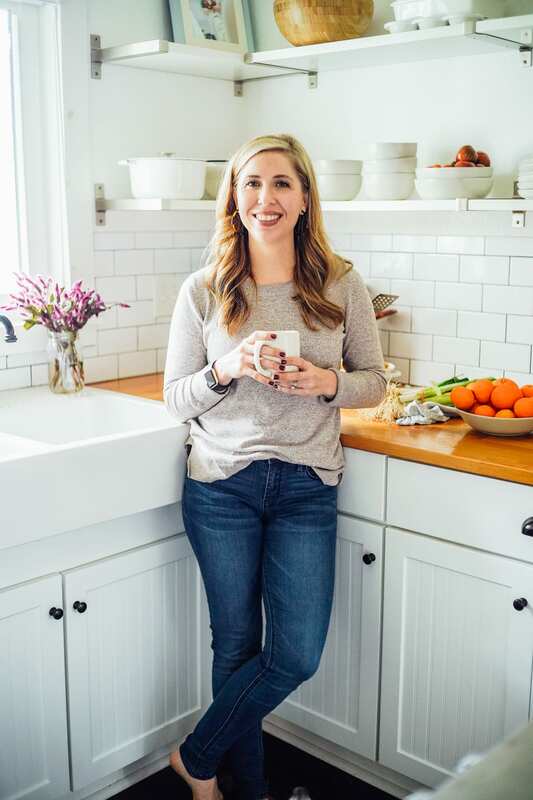 ), chia pudding (for me, when I workout early in the morning before a heartier breakfast), pancakes or waffles (always prepped in advance and waiting in the freezer), yogurt and fruit (sometimes granola), and sometimes a prepped-in-advance hash. I love the routine and dependability of a fixed breakfast menu during these busy months, since I have one less thing to think about in the morning. On Monday, we have eggs and toast. On Tuesday, everyone in the family knows they’re going to be greeted with a smoothie and egg. And so the week continues. I know this type of scheduled eating probably sounds like it gets boring after a couple of weeks, but I’ve found that there’s a place for creativity even with boundaries. Sure, Monday may be an egg and toast day, but that doesn’t mean we always eat scrambled eggs and a slice or two of sourdough. Sometimes I may use extra veggies from the previous night’s dinner to create a veggie and egg scramble. Other times, we may have “jammy” boiled eggs. There are also times when the toast will be plain and simple– just sourdough or sliced from a loaf of sprouted bread (we happen to have an amazing sprouted bakery in our area). There are other times when the sprouted bakery will have a special bread on sale (the latest creation was a cinnamon and raisin swirl bread). Now that summer break is in full swing, I’ve stepped away from my methodical approach to breakfast in order to embrace more spontaneity in the kitchen during the early morning hours. 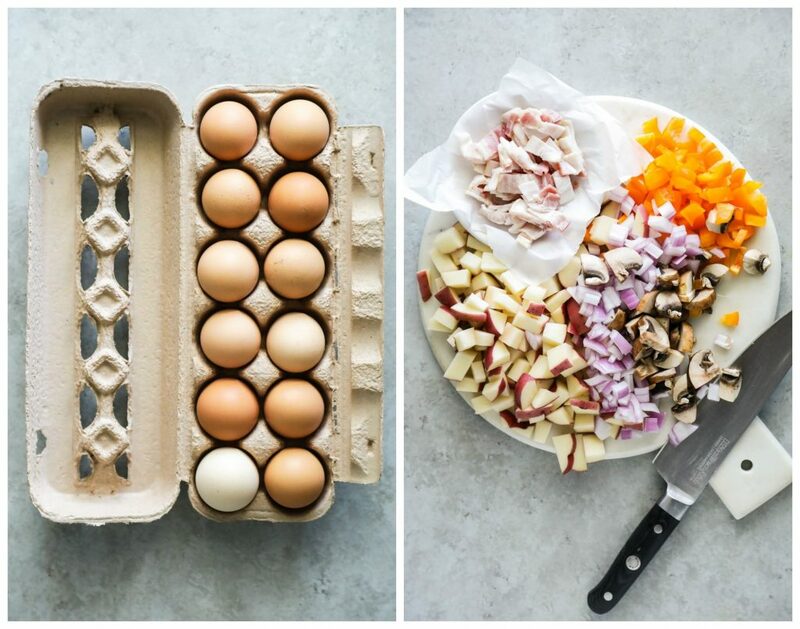 Sure, our breakfasts still feature the same ingredients (eggs, oats, veggies, etc. ), but I’ve tried to slow down and spend extra time making something a bit different than our normal options. One of the slow-down breakfast meals I’ve started making is, breakfast burritos. 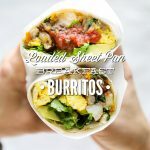 Breakfast burritos aren’t new to me, nor are they new to the blog, but making these burritos in the morning versus prepping them in advance is something new. Since I haven’t been prepping the burritos in advance, I’ve been able to play around with all sorts of different veggies and ingredients, without having to concern myself about how well the ingredients freeze and reheat. 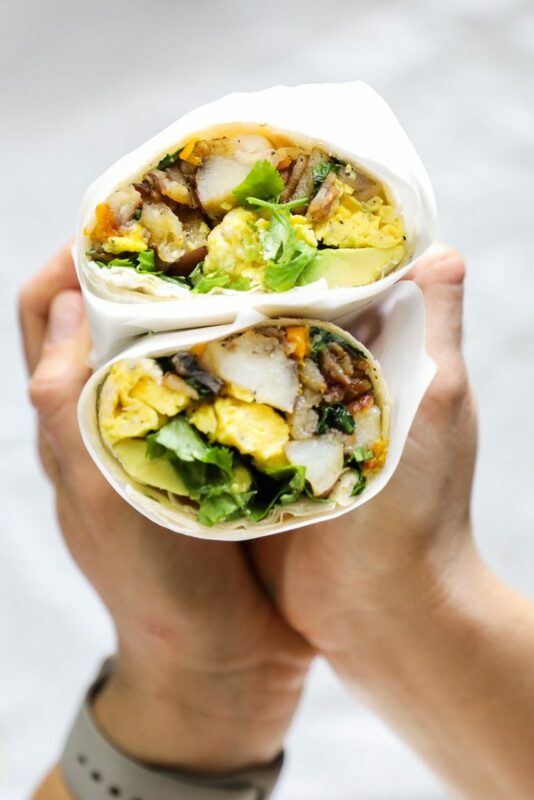 Out of all my breakfast burrito creations so far, our favorite has been the hearty veggie and egg burritos, which happen to also be the easiest breakfast burritos to make. Most of the veggie filling is cooked on a sheet pan. And while the oven works its magic with the veggies, bacon, and spinach, the eggs are cooked on the stove-top, and the cilantro and avocado are chopped and sliced. Once everything has been cooked, chopped, and warmed, the burritos come together in just a couple of minutes. Since my sheet pan does most of the work in this recipe, I’ve decided to give it the credit it deserves in the title. I definitely plan to keep making these burritos well after the summer comes to an end. Since they take a bit more time to make than the typical weekday breakfast meals on my school-year rotation, they’ll become a special weekend breakfast treat starting in September. 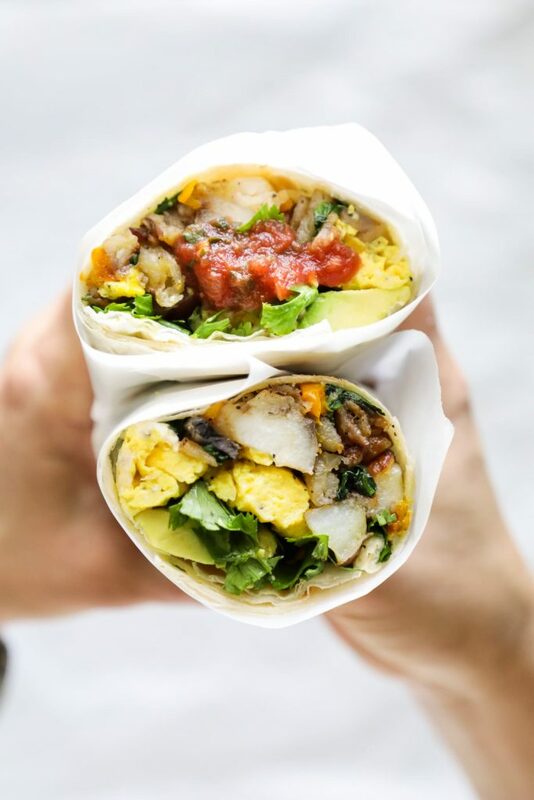 Freshly-made pancakes and waffles are already seen as a special treat on Sunday mornings (a time when we slow down, eat outside on the porch, and sip coffee in our pjs until noon), and now these loaded breakfast burritos can be added to the list of weekend options. 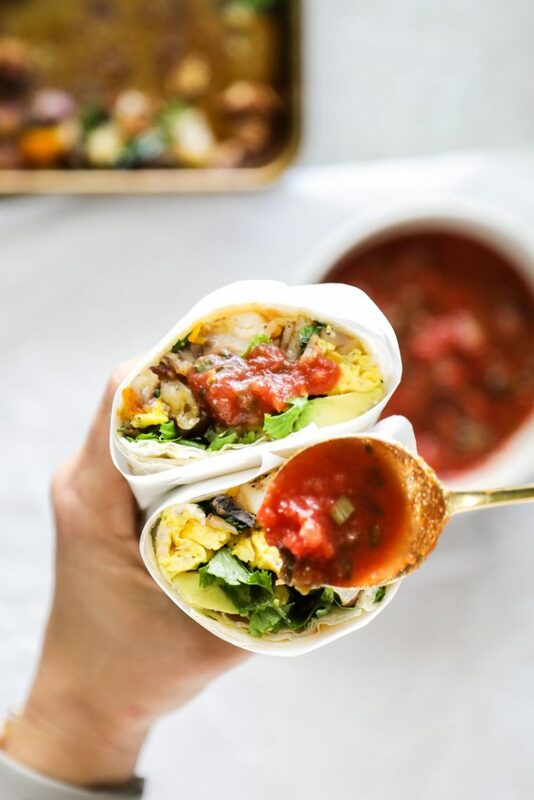 Sheet pan veggies and bacon, eggs, cilantro, avocado, and salsa come together in these loaded breakfast-style burritos. Preheat the oven to 425F. Grease a sheet pan with a bit of oil to prevent the potatoes from sticking to the pan. Add the potatoes, red pepper, mushrooms, red onion, and bacon pieces to the sheet pan. Toss to combine the veggies and bacon. Sprinkle the salt, pepper, and chili powder over the the veggies and bacon. Toss to combine. 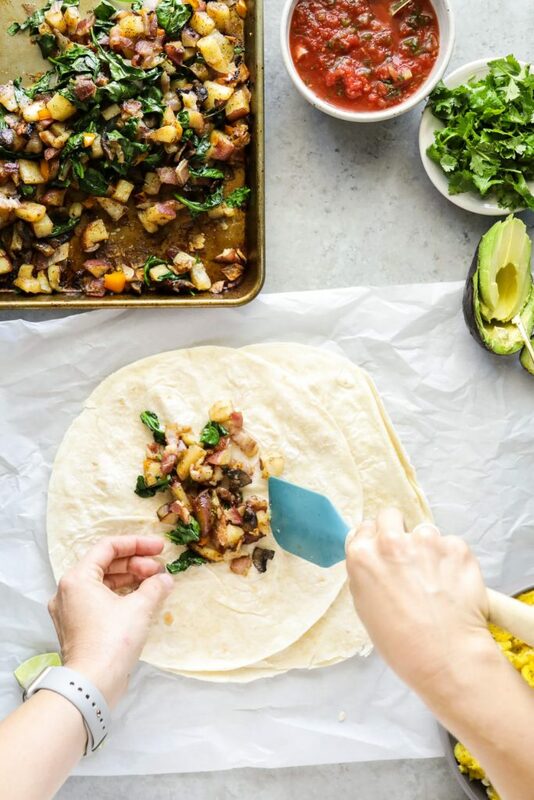 Roast the veggie and bacon mixture in the oven for 15 minutes, then remove the sheet pan from the oven and, using a spoon or spatula, toss the veggies and bacon together to evenly distribute the fat (from the bacon) with the veggies. Roast the veggies for another 20-25 minutes, until soft and slightly crisp. 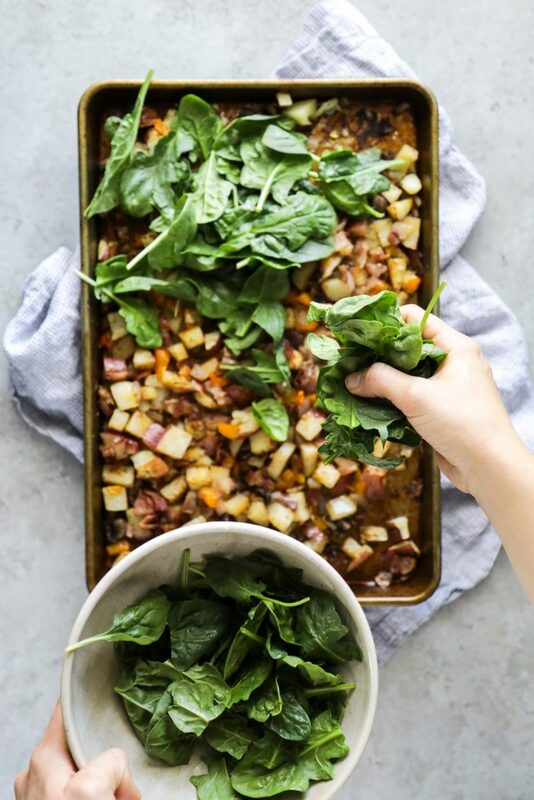 Remove the sheet pan from the oven and stir the spinach into the veggies and bacon. The hot veggies and bacon will wilt the spinach. I like to turn the broiler on low at this point, and place the sheet pan back in the oven for just a few minutes (3-4 minutes). This helps the veggies and bacon crisp-up a bit more. If you do this, just watch the time so the spinach doesn't burn. While the oven is still warm (but everything is now turned off--broiler and oven), warm the tortillas by placing them directly on the oven rack. Once warm, remove the tortillas from the oven and assemble the burritos. Whisk the eggs with the milk, salt and pepper. In a large skillet, over medium-high heat, melt the butter. Add the egg mixture to the hot skillet. Once the eggs begin to set a bit on the side of the skillet (about 30-60 seconds), use a spatula to pull, lift, and fold the eggs until there isn't any liquid left. 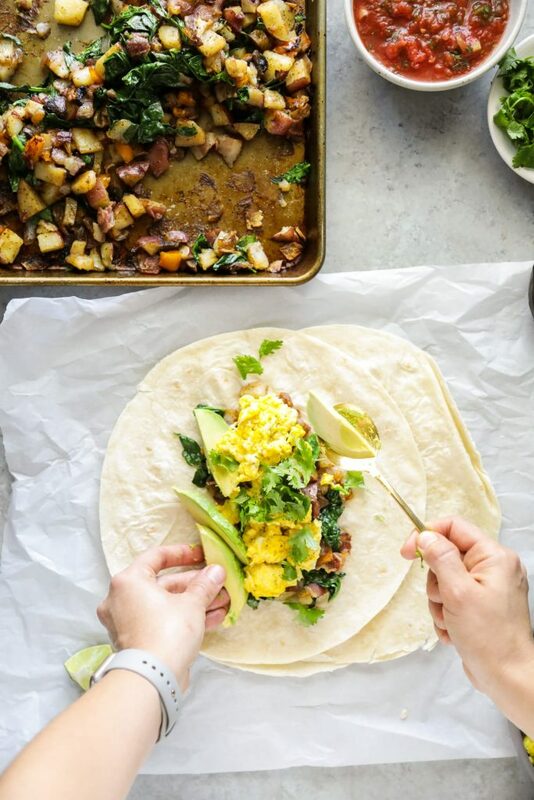 Evenly distribute the veggie and bacon mixture in the center of each tortilla, followed by scrambled eggs, avocado slices, and cilantro. If you'd like, feel free to also add shredded cheese (cheddar, pepper jack, etc.) I personally don't add cheese to the burritos--they're great without it. Serve the burritos with salsa for dipping/spooning over the top (or you can add salsa to the inside of the burritos). Serve immeadiately. *I use red or Yukon Gold potatoes. Leave the skins on the potatoes, there's no need to peel! Make-Ahead Thoughts: I think these burritos would keep well in the fridge for about two days. I haven't tried freezing these burritos, but it's a shot (just try one at first). Vegetarian Option: These can easily be made without any bacon. Simply omit the bacon and toss the veggies with 1-2 tablespoons of olive oil or avocado oil. The flavor won't be quite the same (the bacon adds a nice smokey flavor), but they'll still taste great. I made this burrito for a trip and there were delicious, I added a little bit of jalapeño pepper to make it spicy, my friends love it!!! Thank you for the recipe Kristin!! As always you are the best!!! Awesome, Mabelee! What a great addition, too. Does the bacon need to be cooked ahead of time? Or do you start with raw bacon? Thank you! Hey Meredith, Start with raw bacon. The bacon cooks with the veggies. Thank you, Kristin. We made these today with cooked bacon and ground sausage in the fridge that we needed to use up. They were incredible! Definitely adding this to the meal rotation. Yay, Meredith. So glad you liked them!